Pathrado is a very popular konkani dish. Everyone from Coastal Karnataka knows about it. There are many ways of making it. Here I have posted my mother's recipe. Pathra leaves are available in abundance in the coastal regions of Karnataka. Hence pathrado is prepared often and it is an all time favorite of many people. The picture below is of a pathra plant. Last year I had posted a recipe for Pathrado. In that method Pathrado was made by steaming method. But this method involves pan frying which results in crispy pathrados. The steaming method yields softer pathrados. Pan frying method is little on the unhealthy side as lots of oil is required. But once in a while there is no harm in making them as they turn out amazingly tasty. My mother makes it once in a while and I absolutely love them. Recently I went to New Jersy to visit my cousin and a visit to Indian store was in my list. To my surprise I found Pathra leaves and couldn't stop myself from buying it as pathrado is my husband's favorite. Hence thought of trying this method and the result was- my husband finished 4 pieces within 10 minutes. So Now I don't have to say How it tasted...right? I hope you all will love it too. (Some of the photos are from my old post, as it was difficult to click pictures stepwise, all alone). Wash the leaves and drain out the water completely. Soak the rice for 1-2 hours. Now for the masala: Drain the water in which the rice is soaked and then grind the soaked rice along with grated coconut, roasted red chilli, tamarind and salt. Use minimum amount of water while grinding. The masala should be a thick, fine paste (and of spreadable consistency). Transfer it to a bowl and then add asafoetida and mix well. Masala is ready. First important thing- Pat dry the pathra leaves with a clean cotton cloth. Next- The prepared masala shouldn't be watery. Assembling- Take a big pathra leaf as the base and the lower part of the leaf should be facing you, as shown below. 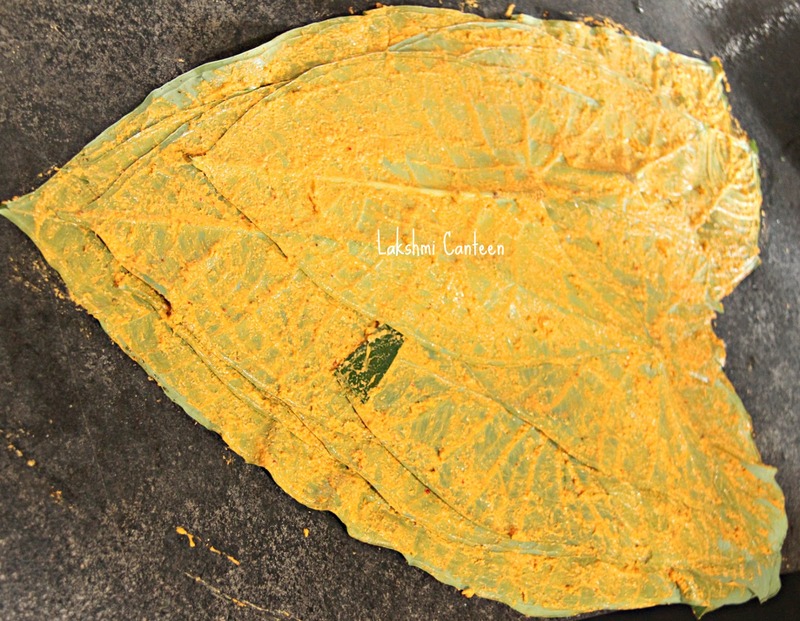 Now give a coating of the prepared masala to this leaf as shown below. Now place one more leaf on it as shown below. Smear the masala on this leaf as done earlier. Now repeat the above process for the remaining leaves (remember that the size of the leaves vary and hence try to distribute the leaves so that you get almost even thickness everywhere). Now next comes the rolling part (have to be little more careful). Fold the leaves on either sides as shown below. Now slowly start rolling it from one end. See that the leaves should be intact and try to roll it as tight as possible. Continue rolling till you reach the other end. Now slowly cut the roll into five equal pieces. Next step is to fry them on a pan. Start heating a wide pan on medium heat. Add oil. Once hot, add the mustard seeds. Once it starts to splutter, add the urad dal and curry leaves. Reduce the heat immediately to medium- low. Once the urad dal changes its color slightly, start arranging the pieces of pathrado in the pan. Now close it with a lid and let this cook on a low flame until the base turns golden brown and crispy (no water is added here and it has to be cooked strictly on a low flame to get crispy texture). Once the bottom part turns golden brown and crispy, then flip it on the other side and close the lid to get the same texture. When done, the color of the leaf changes to a different shade of green. Turn off the heat. Pan Fried Pathrado is ready!! Serve it hot as it is or as a side dish to rice and curry of your choice. Above measurement serves two people. Black bean- Avocado Salsa is a quick and easy Mexican recipe. We love mexican food and hence I keep trying new stuff whenever I get a chance. Avocado is my husband's favorite and eat it once in a week. I used to make Guacamole, Veggie fajitas etc. Once accidentally we came up with this recipe and from then onwards it has been made regularly. This recipe is very dear and near to my heart. This salsa is very healthy and can be made within 15 minutes (excluding the soaking and cooking time of beans). Every ingredient in this dish balances the taste very well. Do give it a try if you are a mexican food lover!! *You can also use canned black beans. I always prefer to use the dried ones as I can control the amount of salt going into it. You can also add a dash of roasted cumin powder to the salsa. Wash and soak the black beans in water for 1-2 hours (you can as well soak it in hot water for half an hour to speeden up the process). Then cook them in a pressure cooker with enough water and salt, for one whistle. Once cooled, drain the beans. The cooked beans should be cooked yet firm. Then chop the onion, tomato, jalapeño, cilantro finely. Then discard the big seed. Once done, take one of the piece and start cutting it by drawing the horizontal and vertical strips as shown below. Care should be taken that the knife should remain within the avocado skin. It can hurt your hand if it comes out of skin. Then scoop out the avocado cubes using a spoon into the bowl containing black beans. Now add the chopped onion, tomato, jalapeño and cilantro into the same bowl. Squeeze fresh lemon juice and salt. Mix well. Black bean- Avocado Salsa is ready!! Serve it immediately along with corn chips or eat it as it is. Above measurement serves 2-3 people. Biscuit Ambado is a popular deep fried snack (as well as for breakfast) in Mangalore- Udupi (Coastal Karnataka) region. These fritters are similar to the medu vadas that are popularly served along with idlis. The main difference between medu vada and biscuit ambado is in their shape (medu vada has a doughnut shape and biscuit ambado has round shape). The basic ingredient is the same for both. I got this recipe from my mother. You can as well add few pieces of ginger to the batter for the extra flavor. Wash and soak urad dal for 2 hours. Drain the water completely. Now grind the soaked urad dal to get a thick smooth paste (minimum amount of water should be used while grinding. If the ground paste is runny then it soaks up lot of oil. So add water in little amount until you get a smooth thick paste). Then transfer the paste to a bowl. Now add in the chopped green chilli, chopped curry leaves, asafoetida, coconut pieces and salt. Mix well. Now dip your hand in water and take a small amount of batter and pour in the hot oil as shown below. Continue to put few more fritters (don't over crowd the oil). Fry these fritters on medium high heat until the fritters get a uniform golden brown color through out. Once done, transfer them on a paper towel, to absorb excess oil. Serve it hot with coconut chutney. Above measurement makes 12 medium sized fritters (just enough to serve 2-3 people). 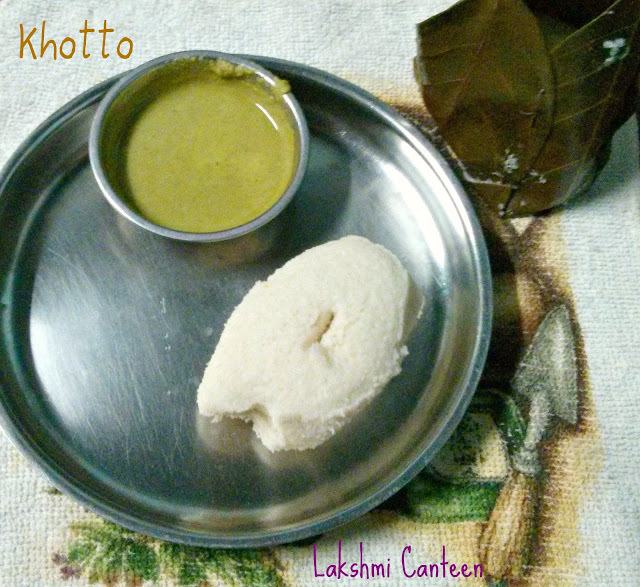 Khotto ( Idli Batter Steamed in Jackfruit Leaves Basket) ~ With A Video!! Khotto is a very popular breakfast in the coastal region of Karnataka. The speciality of this breakfast is the idli batter is steamed in a jackfruit leaf basket. The leaves makes the idli more special. This breakfast is commonly made for every festival and the art of making basket is little difficult. But it can be mastered with practice. Do give it a try if you get a chance to lay your hands on the jackfruit leaves. I am thankful to my brother for recording the video and my mother, for showing the method. The pictures were clicked by me, during my last visit to India. * Even the dried stick of the curry leaves can be used to make the basket. Wash the jackfruit leaves and pat dry using a cloth. Each basket requires four leaves. It is better if the leaves are of the same size. Once the leaves are ready, then start weaving them. Then using the stick lock them together. Then attach the the third leaf as shown below. Then finally the fourth leaf. Click on the video to see how it is made into a basket. This is the ready jackfruit basket (care should be taken while making the basket. There shouldn't be any holes at the bottom. Any small hole can lead to the leak of the batter and make a mess in the steamer). Once the basket is ready pour the idli batter half way through. Click on the video to see. Then steam them in a steamer for 25- 30 minutes or until a tooth pick inserted in it comes out clean. Once done, allow it to cool for 5-10 minutes. Then remove the jackfruit leaves and serve the idlis with chutney or sambhar.